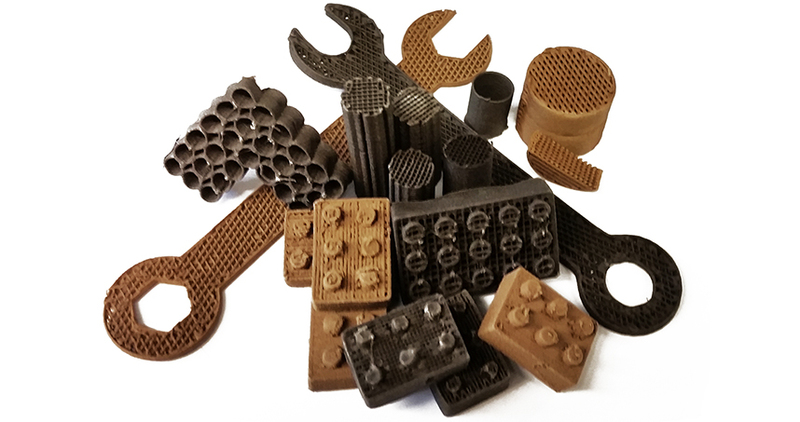 3D printing on Mars; microreactors; 2D nanosheets. Northwestern University has demonstrated the ability to print 3D-based structures using compounds that resemble Martian and lunar dust. The idea is that if humans begin to colonize the moon and Mars, they may require 3D printers. With 3D printers, humans can make small tools, buildings and other objects. For this, researchers from Northwestern have developed novel inks or powders based on lunar and Martian dust simulants. Simulants are objects or materials that resemble the actual material. Typically, lunar powder particles are irregular and jagged, according to researchers. Martian powder particles are rough and rounded. The inks used in the 3D printing process are a mix of evaporants, surfactants and plasticizer solvents. They also include polylactic-co-glycolic acid regolith simulant powders, according to researchers. Then, using a 3D printer, the inks can be printed “at linear deposition rates of 1–150mm/s using 300μm to 1.4cm-diameter nozzles,” according to Northwestern. The resulting structures demonstrated a material porosity of about 20% to 40% with moduli ranging from 1.8 to 13.2 MPa. Using a 3D printer, the University of Helsinki has developed a small polypropylene reactor or microreactor as a means to speed up the metrology process. Typically, chips are produced in a fab. Then, at each step, the devices must be measured and characterized using various metrology techniques. It’s a time consuming process, however. To speed up the process, researchers from the University of Helsinki developed a small, disposable container using a 3D printer. The container or microreactor is connected to a mass spectrometer. The small container consists of a tiny capillary. A solution can be injected in the capillary. This entire metrology process takes place outside the cleanroom. That way, a sample can be processed in real time without waiting for wafer lots in a fab. “By hooking up a microreactor to a mass spectrometer, reactions can be followed in real time with high sensitivity and selectivity. Thanks to this, it’s possible to detect intermediates and even transition states of reactions, making the stipulation of a reaction mechanism possible,” said Sofia Nilsson of the University of Helsinki. Amber, the Science Foundation Ireland-funded materials science research center hosted in Trinity College Dublin, has printed transistors consisting of 2D materials. Using standard 3D printing techniques, researchers combined graphene nanosheets as the electrodes with two other nanomaterials, tungsten diselenide and boron nitride, as the channel and separator. This, in turn, formed a nanosheet transistor. Jonathan Coleman, an investigator in Amber and a professor of Trinity’s School of Physics, said: “We believe that 2D nanomaterials can compete with the materials currently used for printed electronics. Compared to other materials employed in this field, our 2D nanomaterials have the capability to yield more cost effective and higher performance printed devices. “However, while the last decade has underlined the potential of 2D materials for a range of electronic applications, only the first steps have been taken to demonstrate their worth in printed electronics. This publication is important because it shows that conducting, semiconducting and insulating 2D nanomaterials can be combined together in complex devices,” he added. Neuromorphic cyber microscope; nanoLED optical microscopes. Equipment supplier ranking; ‘Porcupine’ test; China buys Xcerra; IC forecasts.